Back on May 30, 2016 we stumbled – literally walked into it – into a Common Snapping Turtle female as she painstakingly dug a nest in the sand bank next to the creek. We watched this millennia-old tableau of reptilian reproduction for over two hours while the gnats and mosquitoes made meals of us. Late May and early June is when we begin to see a lot of these turtles as they cross roads to either find mates or to return to favored nesting sites. Her hind legs made a last few strokes of sand over the nest. A moment of sleepy blinking, then she hauled herself the final yard over now-hot sand back to the creek. Common Snapping Turtle eggs take generally around 90 days to incubate. We wish. We sweated for an additional 20 days, walking each afternoon to the creek to peer into the screened enclosure that shielded the nest from predators. Finally…FINALLY!… on the 110th day, hatchlings! Three quarter-sized babies had burrowed out of the nest cavity and into the sunlight. Only this trio had survived of the the approximately 25 eggs that we found. We moved the newly hatched snappers to the creek. One scurried into the current and floated away. The second burrowed beneath silt and wet dead leaves. The last hauled itself back up the bank into the roots of some plants. Three babies, three escape strategies – which will prevail? A snapper could live 100 years. They all have to survive that first day, though. Later we found five unbroken eggs still in the bottle-shaped nest cavity. These failed to hatch after another 30 days. We found what we estimated to be another 15 broken eggs in the nest. These looked as if they possibly had been eaten by insects or other soil organisms. 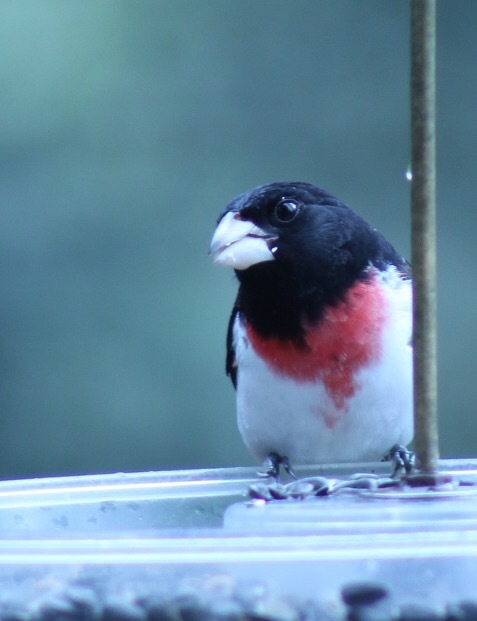 Late April is when we start looking for the arrival of the dashing Rose-breasted Grosbeak. The males arrive earlier, sporting a black tie & tail that flashes white as they flitter around in the hemlocks. Their white cummerbunds sport a rich rose sash that trails off to appear underneath their wings. You’ll find it difficult to photograph them at a feeder without getting seed hulls in the image. They have something of a reputation as “feeder hogs,” using their powerful bills to industriously hull and eat sunflower seed. Fortunately for our sunflower supply, the grosbeaks will soon head north and to higher elevations to breed. 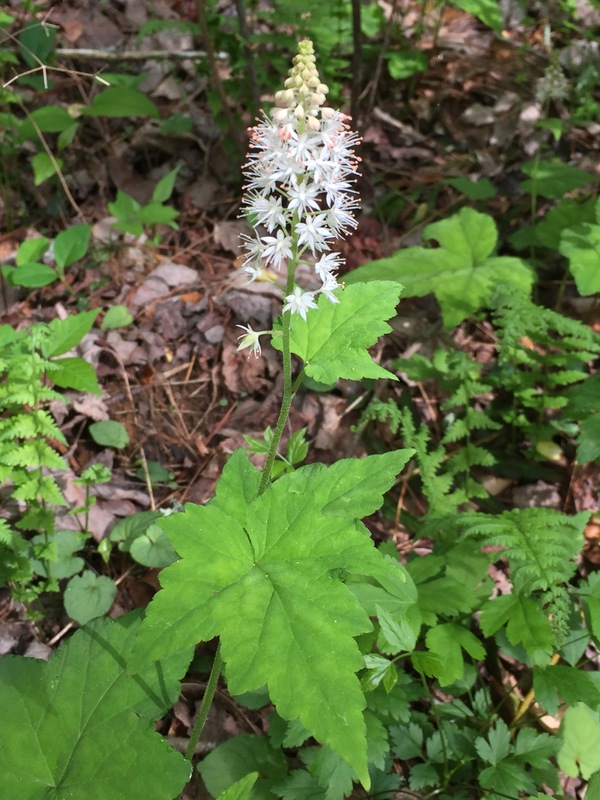 One of our streamside wildflowers this week is Tiarella cordifolia, or Foamflower. We see these in late April through May, when they usually form small clusters of plants in damp and shady spots. Never growing much taller than mid-calf, Foamflower is reportedly a great native ground cover for heavily shaded areas in the lawn. Get out and enjoy our native flora this week! Want to learn more? Visit the Clemson University Cooperative Extension Service’s Foamflower webpage. 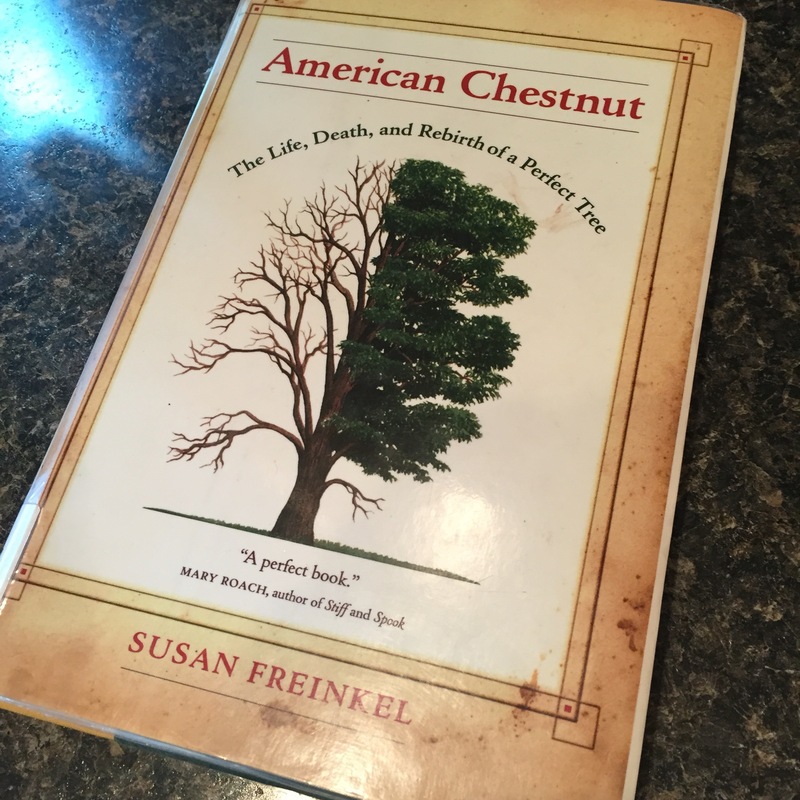 A recent read for me was “American Chestnut: The Life, Death, and Rebirth of a Perfect Tree,” by Susan Freinkel. The American chestnut was once almost an indispensable tree to man and nature alike. Its extirpation in the early 20th century almost upended the Appalachian natural community. Freinkel wrote an very readable overview of the chestnut’s world and what is being done to restore them. Chestnuts ranged throughout the southern Appalachians until a fungus removed them as a meaningful part of the natural community. Chestnuts grew to be the titans of the forested hills. Their burrs blanketed the ground in fall and yielded rich and nutritious nuts. The nuts made up much of the “hard mast” consumed by wildlife such as deer, bear, and turkeys. Humans tapped into the chestnut-powered food web in at least three points. Native Americans and Europeans alike gathered the nuts for themselves and ate the wildlife that fatted on them. Farmers then learned that hogs had much sweeter meat if they were released to forage on chestnuts in autumn. Finally, people brought chestnuts into the subsistence economic web. Mountain people, many of whom were hard-pressed for cash, gathered the nuts in “tow sacks” and sold them to local merchants or brokers for the purchase of store goods. The chestnut buyers consolidated the nuts for shipment by wagon or rail for resale to city dwellers. The Christmas song lyrics “chestnuts roasting over an open fire” described how city folks would often roast the nuts as a snack. Take the time to pick up “American Chestnut” for a solid review of the tree that was once a king of the mountain forest. It’s hard to grasp the wholesale changes in the natural community of the southern Appalachians without understanding the erasure of the American chestnut from it. 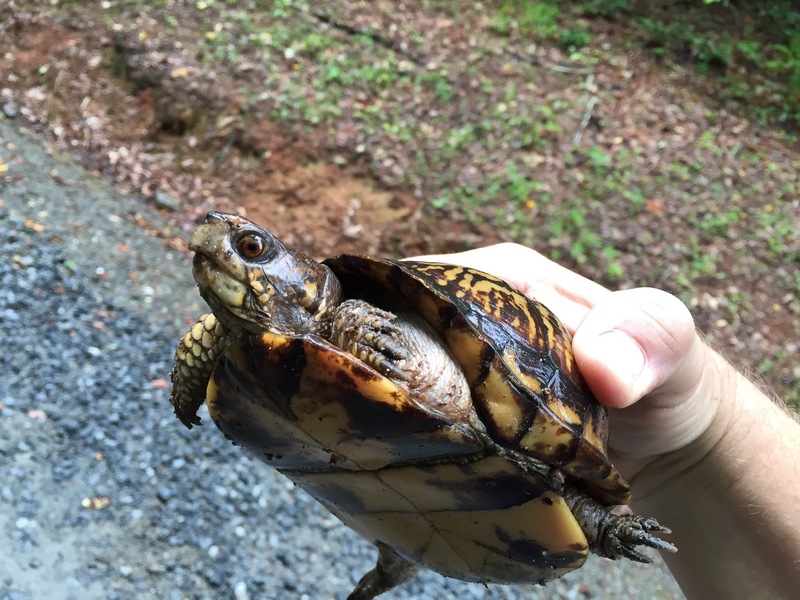 What’s new for 2017 for the box turtle project? By the time you read this we should have our state and federal permits in hand. These spell out the scope of the project for the coming “turtle season”. Of course we’ll continue to search for turtles in order to learn more about where and how they live. The changes will come with some new tools and hopefully some new partners. 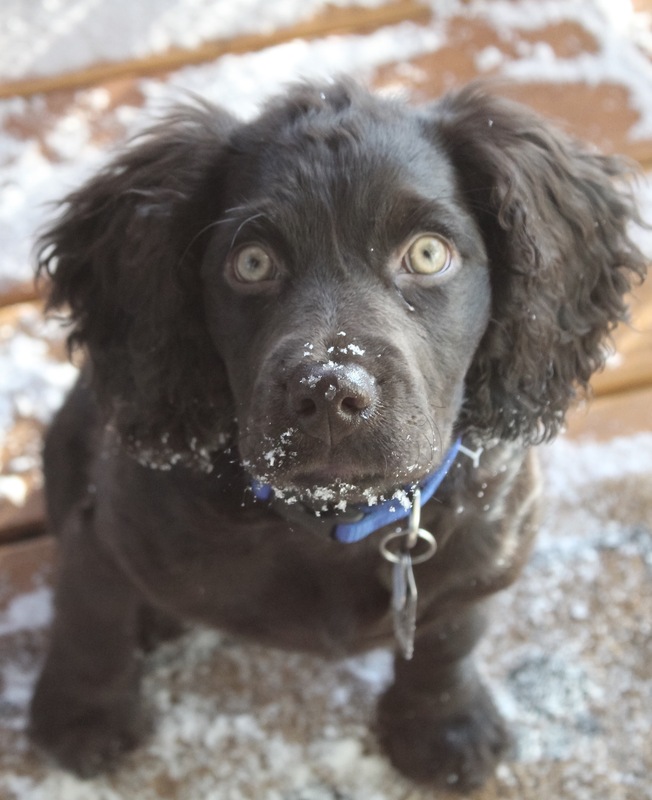 The big news for 2017 is “Ranger,” our new Boykin Spaniel! “Ranger,” a Boykin Spaniel, has already begun his turtle-finding training. Ranger’s new job is to improve the quality of our data by finding box turtles that we miss in the woods. Box turtles are so easily overlooked! Their shells are well-camouflaged. Boykin Spaniels have already been used very successfully in searching for box turtles for other researchers. We hope that we get the same results here. We want to start getting more data about disease in our turtles this year, too. So far, our disease detection has been limited to looking for signs of infection. This year we have also asked for permission to start taking swabbings of turtles. These swabs can then be shipped to cooperating researchers who can test them for the DNA of disease organisms such as ranavirus, herpesvirus, and mycoplasma. The researchers can use that data to answer bigger questions about how certain diseases can spread in a turtle population. To make that happen, we’re going to seek out researchers that have students who are interested in samples for study and analysis. 2016 in review – What does it all mean? What does it all mean? For now, we’re refraining from any “big picture” interpretation of the numbers. We don’t think we have enough numbers from which to draw solid conclusions. Our boxies generally seem to follow the pattern that their activity increases immediately after rain, and especially after a rain day that was preceded by several dry days. When the drought kicked in, then the turtles got off the roads. The ones that were found then usually turned up much closer to a stream bed than in wetter periods. If those observations are sound, then it may be a reflection of the box turtle’s evolution from a purely aquatic turtle, like its relatives, to a more land-adapted lifestyle. They still need lots of water, and they gear their activity and choice of surroundings to finding it. ﻿The neighborhood really stepped up this year in documenting turtles that they saw and moved from roadways. The “turtle patrol” reported a dozen in 2016. Seven of those were thanks to Rick and Jan Dappen. Patti O’Dell and her grandchildren and Greg Withrow and his family saw two turtles per household. Marti and Bob Burgess reported the turtle that has apparently resided in their yard since they moved here (it must know “turtle people” when it sees them!). Many thanks to all of you! 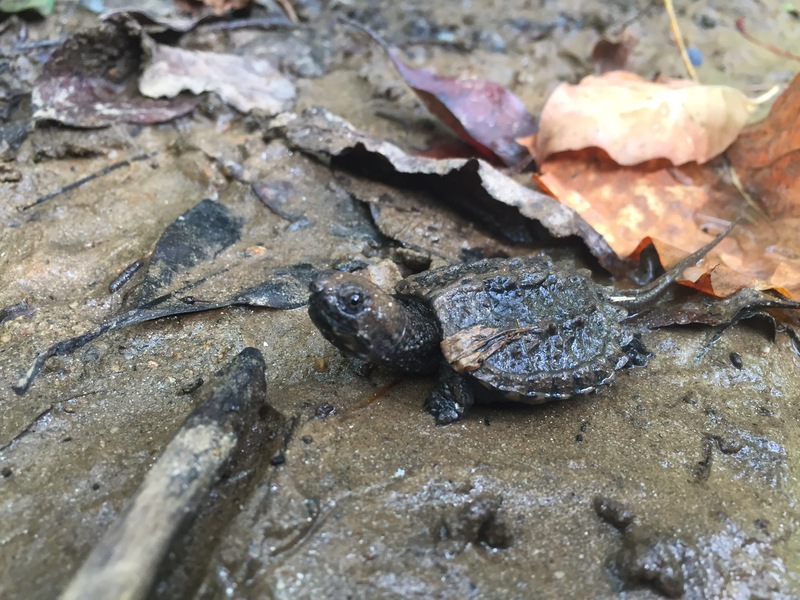 2016 in review – Box turtles and country music? 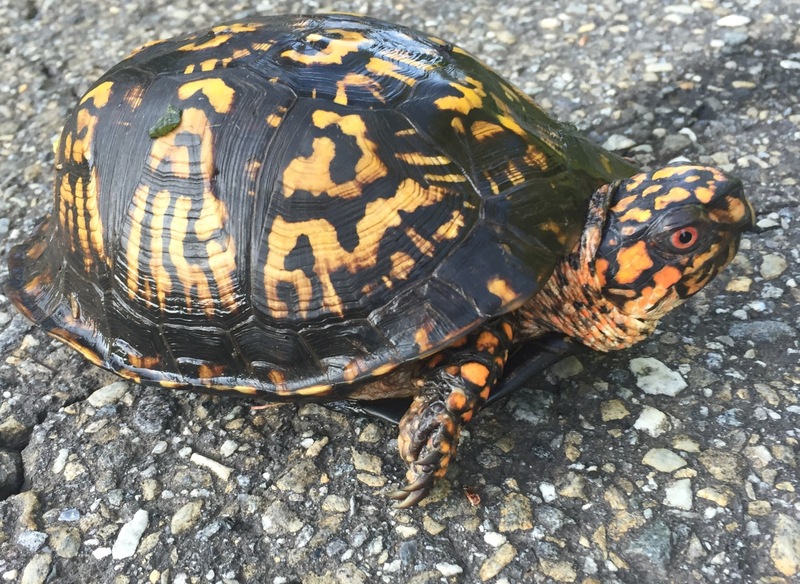 Country singer Luke Bryan says “rain is a good thing!” and box turtles seem to agree. Seventy-eight percent of the turtle finds or reports were within one day of a rain event. When the rain stopped by September, so had the turtles. Why does the turtle cross the road? Beats us. We asked this one. Not chatty. ﻿We had 36 turtles that were either found or reported to us in 2016. Three turtles were found more than once. One was found three times (guess it really liked us!). Twenty-six turtles were measured and then marked with a unique code. Some were not marked because they were either found dead or were reported to us by the “turtle patrol” that photographs and reports the ones that they move out of the roads.